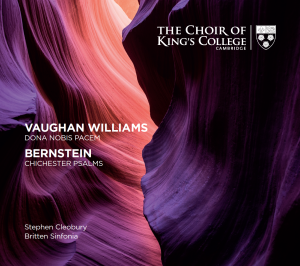 On Friday 3 November we release the latest in the Choir’s own-label recordings: an album featuring Vaughan Williams’ Dona nobis pacem and Bernstein’s Chichester Psalms. The Choir joins forces with the Britten Sinfonia, Ailish Tynan and Roderick Williams for this album of two much-loved choral works. Both are recorded in orchestrations for smaller forces to match the size of the Chapel Choir: the Dona nobis pacem is presented here in a brand-new arrangement for small orchestra, commissioned for this recording, resulting in an intimate performance that brings new and different colours to Vaughan Williams’ work. The Chichester Psalms is performed in Bernstein’s own orchestration for organ, harp and percussion, and both performances include the recently-restored Harrison & Harrison organ in King’s College Chapel. To mark the release we’re offering two free tickets to see the Choir and the Britten Sinfonia in concert at London’s Barbican on Saturday 2 December, where they’ll perform both the Chichester Psalms and the Dona nobis pacem. To enter, see our Bernstein Competition page. You can order your copy of the album on surround-sound SACD or stream and download the album from your favourite digital platform.